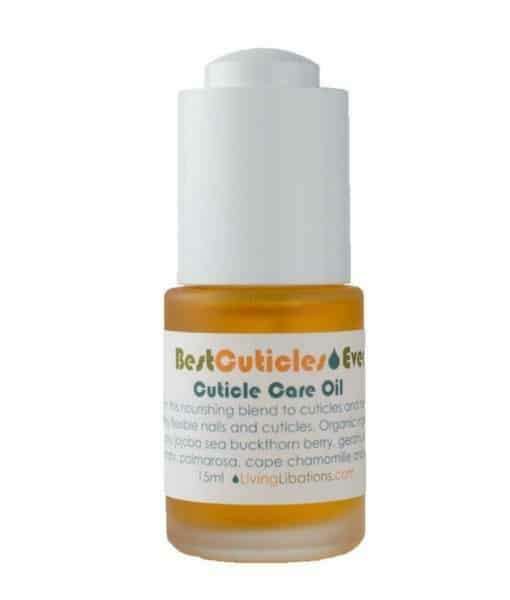 Put your best hands forward with Living Libations Best Cuticles Ever CuticleCare Oil. Don’t let dry, dishpan cuticles get out of hand! Anoint these nourishing botanicals into nail-beds for hang-nail free, flexible nails and cuticles. Revitalize your hands and nails and wave bye-bye to rough hands and ragged cuticles. Best Cuticles Ever Cuticle Care Oil is a massively moisturizing and dryness drenching serum – a botanical cornucopia for cuticle care. Seabuckthorn (Hippophae rhamnoides) Super Critical Extract – Seabuckthorn sends its lipids into the skin. This supercritical extract is packed with omega fatty acids 3, 6, 7, and 9, antioxidants, vitamin, palmitoleic acids, carotenoids, and phytosterols. A single drop of seabuckthorn oil contains 190 different bioactive compounds. This bright orange essence is incredibly regenerative – relaxing redness and paring puffiness. Simmondsia chinensis (Jojoba), Calophyllum inophyllum (Tamanu), Hippophae rhamnoides (Seabuckthorn), Rosmarinus officinalis (Rosemary), Cymbopogon martini (Palmarosa), Pelargonium graveolens (Geranium), Arnica montana (Arnica), Anthemis nobilis (Chamomile), and Lavendula angustifolia (Lavender). I am so glad Living Libations came up with a cuticle oil, this is the best product for growing healthy nails and cuticles! No more ragged cuticles and dry nails (which I have fought for years). I put this on a couple times a day and in no time my nails were much stronger and my cuticles looked so much better. I love to put this in the living libations hand cream for an extra moisturizing treat for my hands, or on my feet and lips. Multipurpose, revitalizing and softening. I have already given one away as a gift. Never anything but divine products from Nadine and Ron. Thyroid issues and years of anxiety cuticle ‘picking’ has left my poor hands in terrible shape. This oil has been such a step up from the lotions and creams that I’ve tried over the years that never really sunk in and healed. I put this oil on every morning when I get to work and right before bed and work it into my nail beds and the calluses that have formed around them from years of picking and chewing. My nail beds have never looked better and any hangnails that I develop are softened to where I don’t notice and pick at them. My cuticles are moisturized and soft all day, even after washing hands. The other day my feet and heels were so dry at work that I pulled this oil out and rubbed it on my feet. They were so soft all day and smelled so good!! Wonderful product!! My nails love this oil, they are much stronger. This and the hooray hand cream have saved my dry flaky nails.